First, I have not watched Jonathan's video. At 30 minutes long, a video is a very slow way of gaining an understanding. I'd rather read. There is a similarity between atmospheric transfer of IR radiation and headlights in fog, but there are also significant differences. be scattered, at which point we still have a photon of the same wavelength, but it is travelling in a different direction. IR doesn't get scattered in the atmosphere - the wavelengths and molecular and particle sizes don't match up. It either is transmitted or absorbed. The ratio is expressed by Beer's Law, which is logarithmic. Over a given distance, if 10% is absorbed and 90% transmitted, then the next equal distance will absorb another 10% - but of the 90% that was transmitted - i.e., 0.1*0.9 = 9% of the original, not 10% of the original. The transmitted amount after 2 units is 0.9*0.9 or 81%. Over N units of atmosphere, the transmitted amount passing through is 0.9^N - so after 10 units of "10% per unit" we get 35% transmission, not 0% (10*10%). At 50 units, we're now at 0.5% transmission. Is the transmission "saturated" at 50 units? Some might say yes, because if we increase the absorption per unit to 15% (thus, transmission per unit = 85%, or 0.85), then at 50 units we see 0.03% transmission (0.85^50), but so what? We only had 0.5% before anyway... is there really any difference between 0.5% and 0.03%? If we look at what is going on at 10 units, however, 0.85^10 = 0.20 or 20%. At 10 units, we've dropped from 34% transmission to 20%. The concept of "saturation" is now dependent on where we are. What seemed "saturated" at 50 units doesn't quite look that way at 10 units. Once absorbed, energy will be re-radiated as IR again, but the re-radiation happens in all directions. Half of that will be moving down, not up, and to get it out to space, it will have to be re-radiated several times. 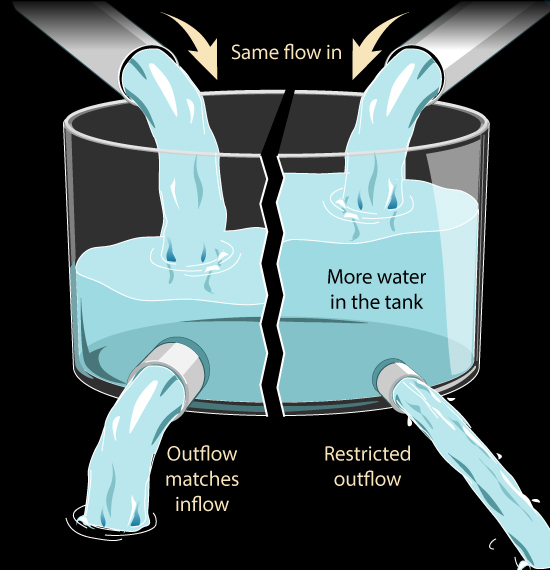 The more CO2, the more times it will be absorbed and re-radiated, and the more times that happens the less efficient it is and the warmer the surface must be. This is the basic greenhouse effect. Now, back to lights in fog. Most of the light passing through fog will be either transmitted or scattered - not much is absorbed. The amount transmitted directly still follows Beer's Law, though. A lot of the scattered light still travels forward, but we'll be seeing it from other angles - not directly. We can "see" the lights as long as the amount of light transmitted directly is still greater than the amout we see that is being scattered by the fog. Once too much of the direct light is scattered, the headlights get "lost in the fog". When we can't see the lights at 100m, we might say "the fog is saturated", but at 50m we can still see the lights. (Tom makes this point above.) If the fog gets heavier, the person at 100m can't tell the difference, but the person at 50m does - until she can't see the lights. Another person at 25m still does, though, and when the fog gets heavier and you can't see the lights at 25m, you still can at 12m, etc., etc. etc. Each observer is looking at exactly the same lights and atmosphere, so if only some of the observers are saying "it's saturated" and other aren't, then the concept of "saturation" is not actually a universal property of either the lights or the fog - it is something that tells us more about the observer's position than anything else. This is not a useful concept for radiation transfer. Now, to compare IR to lights in fog, the big difference is absorption vs. scattering. But just as absorbed IR is re-radiated both up and down, the lights are scattered both forward and backwards. The observer standing 50m from the car will see the lights fade into the fog as it gets heavier, and the driver of the car will get more of the light shining back in their face as the fog gets heavier. What the driver sees in back-scatter is similar to IR "back-radiation". Even though the observer at 100m says "the fog is saturated", the driver can tell the fog is getting heavier. Just as the case with increasing atmospheric CO2: although the observer at the top of the atmosphere might be thinking "it's saturated", the surface can tell that the IR effect is increasing. In another simliarity, although the viewer of the car can't see headlights at 100m, they do see light (let's do the thought experiment on a dark road at night). Brighter headlights won't help the viewer see the headlights, but the fog-light will increase. Just the same, as the earth's surface temperature increases, you still won't see direct IR loss to space, but the total IR transfer upwards can increase. Where do you get the "absorption of IR is effectively saturated near the ground at sea-level pressures, with the average absorption path length being quite short (in the order of meters)" statement from? Even at wavelengths were CO2 absorbs, my impression is that it can travel significant distances. IR spectromoetry is a common method of measuring atmospheric CO2 concentrations, and commerical sensors can handle up to 3000ppm, IIRC, suggesting that at 300-400ppm we're far short of "saturation". Bob Loblaw - Sorry if I wasn't specific enough, that's absorption at major GHG frequencies. There are plenty of atmospheric windows and lower sidebars of partial transmission, but for strongly absorbing frequencies CO2 has a mean sea level path length of ~33 meters or so. Ach, horrible reference in my last message - turns out the author is a denier of CO2 as a GHG, my apologies. He doesn't seem to understand what happens when there is a change in effective radiating altitude. Still, the path length discussion is reasonable. Bob... Thanks. That makes sense to me. I figured that Jonathan had essentially tripped himself up with his insistance on using the fog metaphor. He makes that error very early in the video and essentially continues off in that direction for the rest of the 20+ minutes. KR... Yup. He's a CO2 as a GHG denier, and a college professor as well. You prompted me to dig out my copy of Pierrehumbert's Principles of Planetary Climate, but unfortunately his graphs of CO2 absorption coefficients are in units of m2/kg and there is no easy conversion to simple units of length. Too much math for an evening at home at the end of a long weekend. ...but, to read the reference you linked to, what I find there is a series of calculations ultimately based on density, which appear to estimate how much of the volume of air is occupied by CO2. This is used to calculate the "mean free path length of quantum/waves in the atmosphere before colliding with a molecule of carbon dioxide". I suspect, but have not done the math to confirm, that if you repeated the calculation for nitrogen (much more prevalent in the atmosphere) that you'd get an even shorter "mean free path length" for N2 - but we know that N2 does not absorb IR strongly. He does seem to think that "molecules of water vapor and solid particles" in the atmosphere are much more important, basically because photons will run into them first. In other words, I think the 33m that he comes up with has absolutely nothing to do with how far a typical IR photon travels in the atmosphere before being absorbed by CO2. We do know that photons outside the CO2 absorption wavelengths will go a lot further than ones at the appropriate CO2 wavelengths, and his calculations do not identify that. Oddly, even though he calculates a "mean free path length" much shorter than I would expect for the distance before IR absorption, he also uses this to conclude that CO2 is not a greenhouse gas. This conclusion appears to be due to the speed with which an IR photon can escape the atmosphere. Overall, I think his math is just a bunch of technobabble that amounts to an argument that trace gases can't be radiatively active. It's an odd flavour of CO2 is just a trace gas. Not just a Professor, but a "Scientific Research Director". Unfortunately, if I try a Google search for "Biology Cabinet Division Mexico" - his stated location. I only seem to find links to other copies of his paper at the usual denial web sites. He's a legend in his own mind. I did find a set of lecture notes at this link. 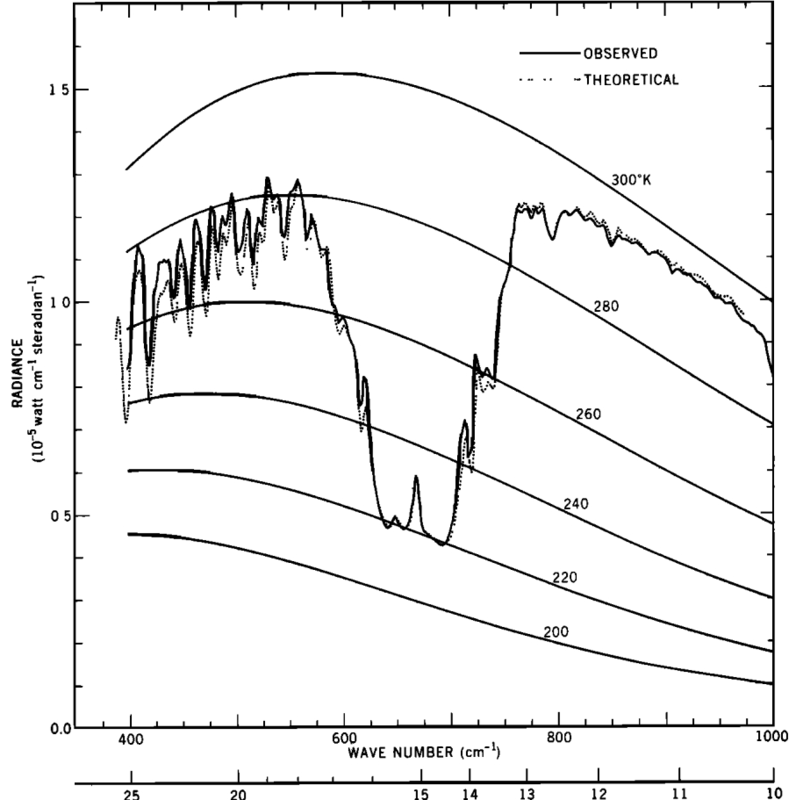 Figure 7.3 seems to suggest that even at the peak absorption bands you see a few percent of IR reaching 13km altitude from the surface, but that graph is at higher wave numbers (lower wavelengths) than the most active IR absoprtion bands. 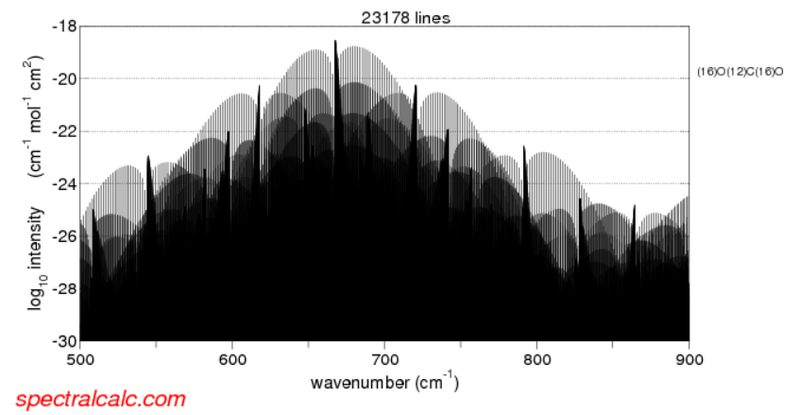 Figure 7.2 is a much lower resolution, but does show the greatly-increased absorption by CO2 as you move out into the longer wavelengths. Interesting reference. Unfortunately the graphs cover different parts of the spectrum. Fig 1 is for CO2, smack bang in the center of its absorption curve. And it shows just how big a factor line-broadening is. Even just at 667.0cm-1 there is about 83% transmission - 17% absorption - after 1 meters. So about 15.5% transmitted after 10 meters and it takes around 170 meters to match the absorption at the peak. Fig 2 actually cuts off the peak absorption region for CO2 on the far right just as it has dropped to maximum absorption. Fig 3 is centered near the peak of the Ozone absorption, with only a modest role for CO2 there. Referring to the opening equation - 7.1 - the Spectral Intensity S of CO2 is one of the key factors here. The other factor, the function f() covers line broadening etc and is where a lot of the complexities are. Notice the vertical scale is logarithmic. There is a roughly 6 orders of magnitude difference between the height of the peaks at the center and the peaks at the edges. Those are the wings. Glenn Tamblyn - Far more accurate than the references I was looking at. "Saturation" is a horrible term, really, inappropriate for an exponential decrease with distance as there is no specification of an end-point. Far better to use e-fold distance or mean path length - some measure with actual values. Increasing GHGs increase that altitude, decreasing IR to space, creating an imbalance until the climate and atmosphere warm enough to redress it. Here is a video to give some more detail. I think pedagogically I'm going to tend toward the use of k = T*1.96/(cm•K) for my Wein's Law needs. Though lambda • T = .0029 meter Kelvin will come in handy sometimes, too. I'm still looking into this issue. How is the analogy "apt" and how is it not? The headlights should not only illuminate the fog, but should actually bounce off the fog. When the light bounces off the fog, since light has momentum, it does change the kinetic energy of the molecules in the fog. But when you turn the headlights off, the fog does not continue to glow in visible light. Rather, the light dissipates fairly quickly. I guess I have two major questions in this area. (1) Why does the visible light reflect off the fog, when it does not reflect off a region of no fog? My hypothesis would be that H20 has a significant absorption/emission spectrum in the visible range, wheras Oxygen/Nitrogen/Argon do not. (2) Why does the light immediately dissipate once the headlights are turned off? My hypothesis would be that the internal energy of the fog is not sufficient to activate those modes of motion. Checking my assumptions, I'm thinking that a gas cannot emit, absorb, or reflect light in any spectrum where it is completely transparent. But fog is not transparent in visible light, so by that assumption must be absorbing, emitting, and reflecting visible light. It's just not heating to the point where the visible light becomes a significant part of its blackbody spectrum. Jonathan Doolin - Major issues: scattering is not absorption. Scattering redirects incoming light in an anisotropic (angle-dependent) fashion. Fog scatters visibile light with neglible absorption, and when the headlights turn off the scattered light ceases as well. Think pachinko balls for this. There is a very small amount of momentum transfer involved, nothing on the level of thermal absorption. Absorption raises the energy of the absorbing molecule, contributing to the thermal energy of the gas - if all other things are held equal an equivalent amount of past absorbed energy spread across the emission spectra will be thermally emitted by that gas volume at some later point (not, generally, at identical frequencies to incoming photons, or from the same molecules, but in the same spectra range), isotropically. This is a completely different phenomena. So no, fog is not an "apt" analogy to absorption/emission in any way. If you start from that as your analogy you are already pointing in the wrong directions, even without the logical error of trying to reason analogically rather than in the system of interest. "If you think that the line of argument that led you to believe something about X might also apply to Y, don't talk about X. Apply the reasoning to Y and see if it works." Jonathan Doolin - I took a quick look at your video, and there are numerous conceptual issues present. 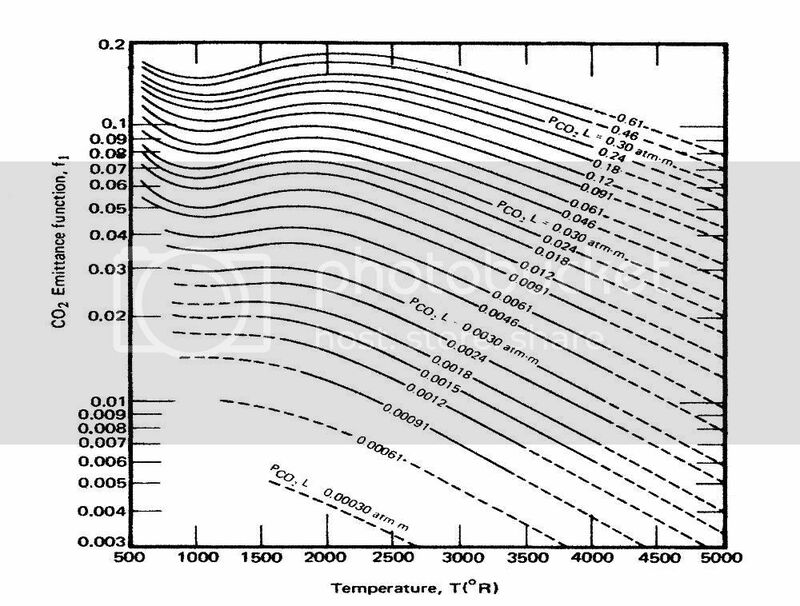 A 'blackbody' emits as per the dotted lines shown for various temperatures. Perfect blackbodies are not real, although some objects approach it for specific frequency bands. The ground, for example, has an emissivity of 98-99% in the IR range (98-99% of an ideal blackbody) - anything less than that in satellite observations indicates emission from something else in the atmosphere, rather than in an IR transparent window. What you are looking at in any of the satellite or ground spectra is the result of many different molecules, many different gases and/or materials. CO2, H2O, O3, and other gases absorb and emit based on their molecular structure, acting as frequency dependent antennae. 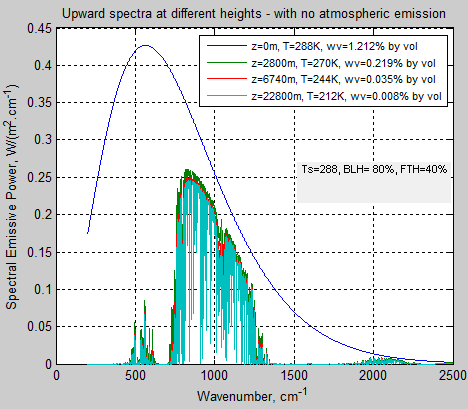 And the different levels in the spectra reflect what temperature the emitting object is, and (by the lapse rate) where it's located in the atmospheric column. You cannot treat this as the emission from a single object or material. The small graph you looked at for an ozone peak appears to be from Harries 2001, and is a graph of changes in emission to space from 1970 to 1996 with increasing GHGs - it's a delta graph. I would strongly suggest some introductory reading to orient yourself to the general principles involved, such as the Greenhouse Effect Basics on SkS. To be quite frank, the gaps in your understanding will otherwise will prevent any useful technical reasoning on the issues. I agree with KR that using analogies to understand something can be problematic. And your introduction of 'reflection' and 'diffraction' is inaccurate. Reflection only occurs when light interacts with a surface of a solid or a liquid. It does not apply to a gas. Similarly diffraction occcurs when light passes through a surface into a solid or liquid. In the case of fog both of these things occur. Light is reflected off the surface of the drops of water and is also diffracted through the drops. Additionally there is also scattering of the light by the droplet. In all three cases the photon of light is not extinguished, its trajectory is simply changed. None of these three phenomena are relevent to understanding what is happening wrt the GH gases. Reflection and diffraction don't apply and at the infre-red wavelengths involved here scattering is negligible. So everything wrt GH gases is about absorption and emission. In absorption the GH molecule actually absorbs the photon. The energy of the photon is added to the energy of the molecule and the photon ceases to exist. In emission the molecule actually creates a photon which 'launches' away in a random direction, taking some of the molecules energy with it, leaving the molecule with less energy. The form the energy takes within the molecule is important. A molecule can be thought of as a collection of atoms that are joined by elecrical bonds. The bonds allow the individual atoms to jiggle around relative to each other - the molecule isn't a rigid body. You could think of it as if each atom in the molecule is on springs connecting it to its partners. So there is energy involved in this vibration. And when a molecule absorbs a photon the photon's energy is added to this vibration and the atoms jiggle harder. There is a second mechanism that applies to a few GH molecules, notably water. Molecules don't just vibrate internally, they also tumble and rotate. Some molecules are able to absorb energy from a photon and convert it into a change in the rotational motion of the entire molecule rather than internal vibration of the atoms. Finally there is the movement of the molecule through space and the absorption of the energy and momentum from the photon contributes to changing that. Because the energy the molecule absorbs is in the form of mechanical, energy of movement it is then easily able to be transferred to other molecules around it through collisions. Molecules in the air at sea level each undergo billions of collisions per second with other molecules, mainly th non-GH gases oxygen and nitrogen. So when a GH molecule has been energised by absorbing a photon, it will usually actually lose that energy through collisions. So the absorption ends up adding to the total pool of energy present amongst all the molecules in the air. The main gases in the atmosphere, oxygen and nitrogen can't absorb or emit infrared photons so it might seem that the energy from the absorbed photon has been lost forever, never to be released. But thhis is not the case. Because GH molecules can also be energised in collisions with other molecules. At any instant a certain percentage of the GH molecules in the air will be in a more energised state due to recent collisions with other molecules. Mostly they will be de-energised again by another collision - it is estimated that around 1 in 50 collisions between molecules cause changes in the internal vibrations of the atoms - but occasionally they will de-energise instead by emitting an IR photon. So the molecule that absorbed the photon may not be the one that emits it later. ... And after a short distance is likely absorbed by another GH molecule and the game starts all over again. It really is like a game of billiards in 3 dimensions and on a vast scale. So, going back to your use of the fog analogy. It might have some merit if used carefully, strictly defined as an analogy for illustrative purposes only but it shouldn't be used to derive an understanding of the process. And to be useful you need to introduce something missing from the simple fog analogy. Even when there is no headlight shining through it, the fog is glowing from its own internal energy. If the idea of a gas glowing seems strange, look up at the sky. The Sun. A big ball of gas and plasma that is glowing very, very brightly. Well cooler gases glow as well, just not as brightly, and not in the visible spectrum, but in the infra-red. I needed to understand what fog is, so I could understand why CO2 is not fog. I guess that fog is made of tiny little balls of water, that have reflective surfaces. I did not realize that Carbon Dioxide only absorbs and emits, but does not reflect. This is a very helpful answer. A good catch. I had realized that figure 7.3 in that source was not covering the peak absorption wavelengths - hence my reference to figure 7.2 where the right side shows much greater absorption. Other references I had on hand gave absorption coefficients with units such as kg/m2. When using Beer's Law, you must be careful of units, and typically simple distance (e.g., metres) isn't one you'll see because distance isn't a measurement of the amount of gas - you need density, pressure, etc. to get the full picture. I wasn't about to try to figure it out late at night, and missed the context of figure 7.1. I had also looked at table 7.1 in that document, which gives several possible units for path length, including "cm" and "cm atm". I don't think either one of them is intended to be simple linear distance. It is possible to measure gas amount in length units, but the length isn't ordinary distance. Take ozone for example, where a Dobson Unit (a common measure of total column ozone) represents a thickness of ozone of 10 µm, when compressed to standard tempeature and pressure. The WIkipedia page also calls that a "milli-atmo-centimeter", so I'm going to guess that the "cm atm" unit in table 7.1 is a similar measure. Thus, just because an absorption coefficient has units of length doesn't mean the path length is really distance or height. The data from figure 7.1 does definitely appear to represent a physical path in the free atmosphere of 1 metre, though. They refer to 100 and 1000 mb as the pressure, and "typical CO2 concentration". The PDF file I linked to appears to be just one lecture in a course on atmospheric radiation, and the course syllabus is available here. It looks like it has a lot of interesting material. What KR and Glenn said. Scattering and absorption/re-emission are different beasts. Wikipedia actually has an article on Rayleigh Scattering, which in the atmosphere is the scattering caused by the air molecules themselves. Ditto for Mie Scattering, which in the atmosphere is caused by all the particulate matter. In fog, also add reflection (including internal - i.e., inside the water droplets). And in all cases, expect multiple scattering - light that is scattered many times, sometimes to the point where you can't tell up from down (white-out in a blizzard). KR, Thanks for the reference to Harries. But at $32 to read the article, or $199 to get a year's subscription to nature. I'm going to try to figure it out on the cheap. See my comments attached to your video. I've found some errors in the original argument which I would like to address. I've not read all 318 posts, so it's possible that somebody has already corrected them. 1. The correct term is extinction, not saturation. Nothing is being saturated, the 15 micron IR band radiates from earth's surface and is absorbed to extinction by CO2 in the lowest level of the atmosphere (the elevation of extinction is around 500 feet). a. blackbody radiation from the surface which radiates directly into space through the many windows in the spectrum where the atmosphere is transparent to IR. The argument given here only addresses "d" and ignores "a-c" and "e". In fact, the vast majority of radiation to space from earth is from "a"
Another glaring error in the argument given here: it treats the radiation at the top of the atmosphere, I suppose from CO2, as if it were blackbody radiation. I say this because the argument specifically states that if the elevation of radiation is higher, the temperature becomes colder, so the amount of radiation is less. That would only be true for blackbody Planck radiatiors. CO2 is a gas and does not emit blackbody radiation. It emits quantum specific radiation, namely 15 microns, which according to Wiens law corresponds with around 200K. We all know, 200 K is very cold. If the elevation of this emitting layer of CO2 climbs higher, and therefore becomes colder, it makes the temperature closer to 200K and therefore the emission would be STRONGER, not weaker. The giant error in the argument is assuming that as the layer grows colder, it will emit less, when the opposite is true....as it gets closer to 200K the emission increases because 200K is the quantum specific temperature of maximum emission. 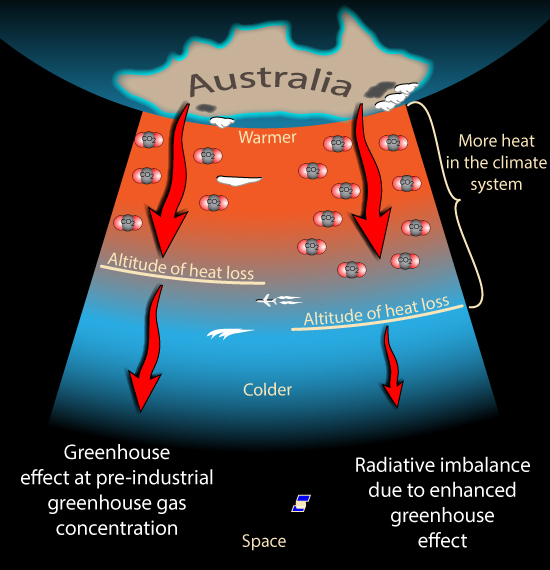 1) The term "saturated greenhouse effect" has a long history, and is well understood. "Extinction" refers to the point at which no radiation from the original source remains - which is a different concept. The greenhouse effect is claimed to be saturated by the misinformed due to the fact that radiation from the Earth's surface is extinguished in the 15 micron band at very low levels (which is a non-sequitur on a variety of grounds). Confusing the two terms only confuses the issue, leading the gullible to believe that the greenhouse effect cannot become stronger with increased CO2 concentration (ie, it is saturated) because IR radiation from the Earth's surface at 15 micron is in fact extinguished low in the atmosphere. The two are not the same thing. 2) I do not believe the article leaves that impression. (Which, article by the way? I assume you mean the basic article.) However, to the extent that it does, it is only because it is discussing the claim that the greenhouse effect is saturated because IR radiation from the surface at 15 microns does not escape to space. Because that is the argument which is being responded to, of course attention is focussed on CO2. As you will notice, only 40 W/m^2 out of 249 W/m^2 of the IR radiation to space comes directly from the planets surface. A further 30 W/m^2 comes from cloud tops. Of the remaining 179 W/m^2, all of it comes from the atmosphere, but most of it will come from water vapour. However, as the greenhouse effect works by replacing a high IR flux from the surface with a lower IR flux from the atmosphere at certain wavelengths, the lower the IR contribution from a given gas, all else being equal, the stronger the greenhouse effect caused by that gas. The argument that CO2 is of relatively little importance because it contributes relatively little to the total IR flux has the relationship exactly reversed, and shows a lack of understanding of the greenhouse effect. If you will excuse me, I will accept such a well confirmed theory as that presented by LBL models over the bad theory of "random internet guy". Because CO2 molecules in the atmosphere gain the energy that they emit by molecular collision, the intensity of radiation at the frequencies in which it radiates follow the black body laws. Therefore decreased temperature will decrease emission from CO2 at 15 microns even though it approaches the temperature at which 15 microns is the wavelength of peak emission for a black body. Indeed, it will continue to do so until molecular collissions occur at a frequency much less than the frequency of reemission of absorbed radiation, or until the temperature is much less than 200 K (so that thermal emission can be neglected). Your first two graphs disagree with each other. The first graph says only 40 W/m2 out of 396 are emitted directly through atmospheric spectral windows, which is only 10%. The irradiance chart, on the other hand, clearly shows that much of the spectrum has high transmission of IR through the atmosphere, with the exception of a big CO2 band from 13 to 18 microns. Your radiance chart is incomplete by the way, because it only goes from 10 microns to 25, when the earth radiates from 7 to 100 microns. The complete chart spectrum, from 7 to 100, shows very little absorption by the atmosphere from 7 to 13 microns, and again very little absorption from 18 to 100, which is a big enough part of the spectrum for me to know that Trenberth's figure of 10% is extremely low. I don't believe it. The large amount of radiance to space from earth surface, through windows, is evidenced by the fact that IR images of earth taken from satellites show surface features such as continents and islands, lakes, etc, which would not be visible if 90% of the IR is absorbed by and re-emitted by the atmosphere. A 90% atmospheric interference of IR would mean the atmosphere is basically transleucent to IR, and IR cameras in satellites would not show continents, etc, but would show nothing but a featureless haze. I don't buy Trenberth's cartoon calculations at all. Every time someone throws issues a challenge to Mr Curtis, I want to get pretzels, his science-powered takedowns are exquisite. "The irradiance chart, on the other hand, clearly shows that much of the spectrum has high transmission of IR through the atmosphere, with the exception of a big CO2 band from 13 to 18 microns"
This is a common misunderstanding. Take the region on the left of Tom's second graph, to the left of wavenumber 600. That is a region dominated by water vapour absorption/emission. And not that the intensity corresponds to a Planck curve with a temperature below 280 K. I.e, well above the surface. What you are seeing there is not IR that has been transmitted through the atmosphere. Water vapour absorbs virtually all the IR leaving the surface. The transmittance is negligible. What is being measured there is IR radiated from higher in the atmosphere. It is not transmitted through it. Siimilarly the CO2 region represents again near total absorption the reradiation at higher altitudes. Much higher than the altitude the signals from the water band are coming from so much colder. So the intensity is so much lower. Look at the spike in the center of the CO2 'notch'. That corresponds to an altitude so high that it is in the upper stratosphere where temperatures are actually warmer. The detailed shape of the CO2 'notch' is a direct reflection of the verticl temperature profile of the atmosphere. Tom's 'graph' is actually taken from an observations based paper from 1970. It is one of three such graphs provided by that paper and covers a larger frequency range, but still ultimately limited by the operating range of the instrument on the Nimbus 3 satellite. Your earlier comment "That would only be true for blackbody Planck radiatiors. CO2 is a gas and does not emit blackbody radiation. "is only partly correct. A gas does not radiate as a black (or even grey) body in that it does not radiate a continuous spectrum with a Planck Function shape. It only radiates over a narrower range of discrete frequencies. However, at those frequencies the intensity of the radiation emitted by the gas does match the strength of a black body at that frequency. Yo are making a claim that the ability to discern continents in IR suggests relatively high transmission. However you haven't backed up that assertion. What part of the IR spectrum is being used in these observtions? What sort of signal processing is being done to the data to allow discrimination of the continents? Do you know that it is being done with raw data? Even if there is no signal processing, is the fact that a portion of the signal does transit all the way to space, even if only 10%, provide sufficient discrimination to allow boundaries to be detected. Unless the sea and closely adjacent land are at significantly different temperatures, how different will they appear on a raw R plot and thus how visible would any boundary be? When we see boundaries in visible light for example we are seeing differneces of intensity, colour, polarisation etc. that form a composite means of detecting boundaries. Is there the same discrimintion available in IR data. Do the images of continents men what you thing they mean? I don't know that answer, I am just posing the question. Trenberth's 'cartoon calculations' aren't his. That paper amalgamates measurements from many different sources to produce that composit picture. And Tom's pont about your misunderstanding Wien's Displacement Law is spot on. Look at his figure 2. Pick any wavelength and compare the magnitude of the different Planck curves shown. Where do any of them show a higher intensity for a lower temperature at any single wavelength? A cooler Planck curve always lies below a warmer one, at all wavelengths. "The argument given here only addresses "d" and ignores "a-c" and "e". In fact, the vast majority of radiation to space from earth is from "a"
"a. blackbody radiation from the surface which radiates directly into space through the many windows in the spectrum where the atmosphere is transparent to IR." There aren't many windows. There is a recognised region around 10-11.5 microns labelled the Atmospheric Window where tranmission through the atmosphere is nearly total. Across the rest of the spectrum absorption is nearly total. What we are seeing in graphs like what Tom has shown is predominantly not transmission. It is reradiation. The light blue shows the transmission to 22.8 kilometers of altitude, ie, effectively to space. Except for very small amounts, almost all of it comes from the 750-1350 wave number "atmospheric window", in which around 90% of surface emitted IR radiation transits the atmosphere. Overall, there will be slightly more than 17% (=40/239) of surface radiation will be transmitted averaged over the Earth in clear sky conditions. That is because no IR radiation from the surface penetrates clouds. Taking clouds into account, the total is reduced to approximately 17%. 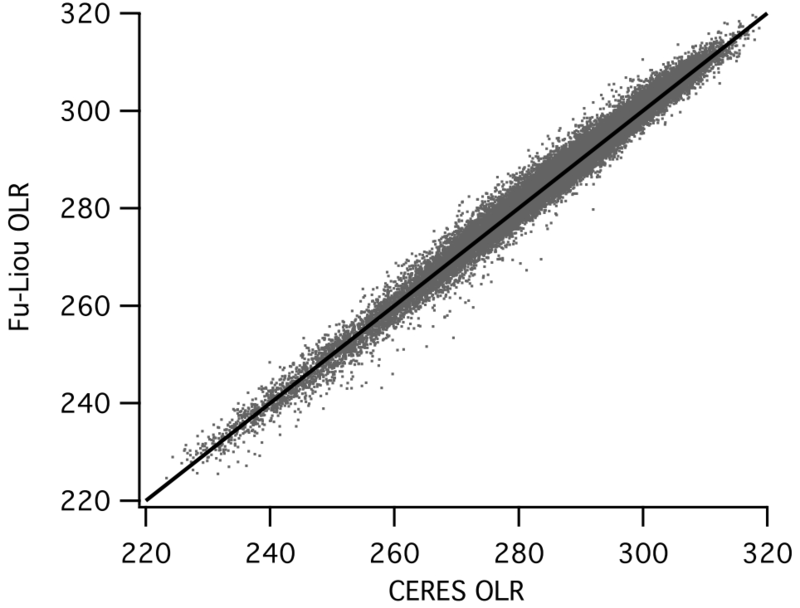 It should be noted that SOD's model does not differ on any principles relative to the models that produced the predicted result in Conrath et al (1970), nor those that produce so good a match to observations as shown in the scatterplot of 134,862 model/observation comparisons by Dessler et al (2008). Those models of prove accuracy, therefore, will produce equivalent results if atmospheric emission is eliminated from them as well. Your mistake is to assume that the IR radiation to space consists of the surface emission minus atmospheric absorption. It is, however, overwhelmingly the result of atmospheric emission, with nearly all (90%) of surface emission being absorbed in the atmosphere. IR satellites are able to produce usefull images because their IR sensors are tuned to the atmospheric window where only about 10% of surface emission is absorbed. Indeed, they will be tuned to the precise frequencies in which absorption is at a minimum. Even so, they do not see through clouds and have a degraded performance relative to optical cameras. Glenn, the images I am talking about are generically known as FLIR which means Forward Looking IR. It's an old-fashioned military term for heat seeking and visualizing equipment that goes back many decades. There are many FLIR cameras / sights on many types of military weapons, where an enemy soldier's human form can clearly be seen using only the IR that he radiates. All objects that emit IR are as clear as if a light camera were taking them, and you can identify humans, tanks, hot weapons (and their ammunition) from 20,000 feet elevation. I don't see how this is possible if the atmosphere absorbs and re-emits IR. I believe FLIR operates at all wavelengths that CO2 emits. I believe that CO2 absorbs IR and turns it into kinetic heat. I do not believe in back-radiation in the troposphere, otherwise FLIR would not work at all. Medium-wave (MWIR) cameras operate in the 3-to-5 μm range. These can see almost as well, since those frequencies are less affected by water-vapor absorption, but generally require a more expensive sensor array, along with cryogenic cooling." Contrast this with Tom's just posted graph. 8-12μm is the 'atmospheric window' plus a bit of the H2O absorption bands on either side. No involvement from CO2. And virtually no backradiation since that only occurs at wavelenths where the GH gases can absorb and thus emit. And 3-5μm is completely off the graph to the right. FLIR works precisely because it works around the absorption properties of the GH gases. Your belief that " FLIR operates at all wavelengths that CO2 emits" is incorrect. And Back Radiation isn't something to be believed in or not. It is something routinely and directly observed. You will notice that both IR camera frequency bands (3-5 micron and 8-12 microns) have relatively high transmittance. Indeed, the average transmittance over the 8-12 band is probably better, but atmospheric radiation is very low in the 3-5 micron band making it more suitable for long distance viewing. The difference between the two bands is that between looking through fog (3-5 micron) and looking through a glowing fog (8-12 microns). The irony of your argument is that the chief database of emission frequencies for atmospheric gases (the HiTran database) was generated by the USAF in order to determine which frequencies were suitable for IR cameras (and heat seakers) and which were not. 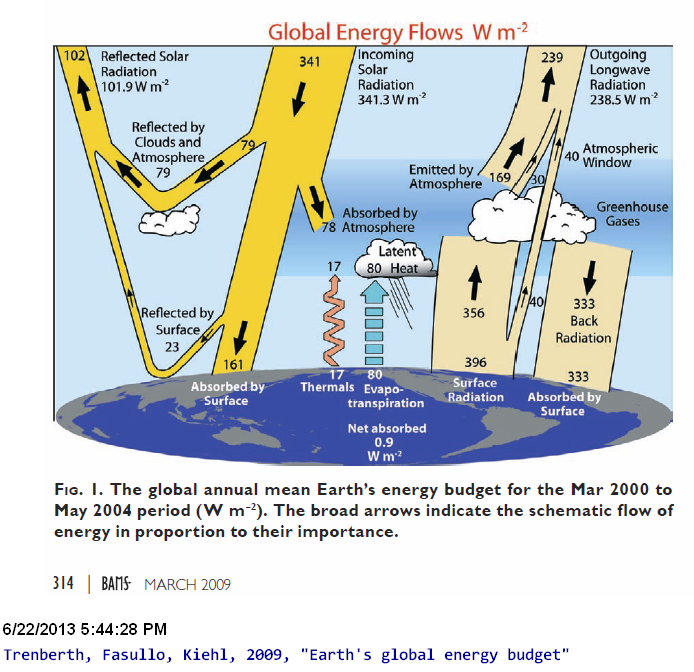 Having constructed their cameras using information from that database applied to radiative models equivalent to those which show the greenhouse effect (as shown above), you now cite the effectiveness of those cameras as disproof of the database and theories used in constructing them. The irony is that you would include a graph that shows 80% transmittence in the N-Band (8 to 13 microns) which is a big fat region smack in the middle of the strongest part of earth's radiation curve, and use it as part of your argument that Trenberth's 10% figure, of blackbody surface radiation making it to space, is correct. I won't link to the article on the N-Band in Wikipedia, I'll let you do it, but if you add that to the J Band and the K Band, I just don't believe it's only 10%. There are more windows in the atmosphere than there are in Notra Dame. If we account for clouds, which cover roughly half the sky, then the figure would be 20%, half blocked by cloud, but that still seems way too low. The N Band is the only one relevent. J & K bands are at wavelengths too small to have any meaningful impact. They are used in Infrared Astronomy because they are studying stars. These obviously have surface temperatures much higher than the Earth so their Planck curves are shifted to lower wavelengths and the J&K bands then sit above regions of the planck curve where the intensity of radiation is significant. However at the Earth's temperature the amount of energy being radiated in those bands is utterly negligible. Look at the graphs Tom showed from SOD. 2.5 μm for one of those bads would be a wave number of 4000 - of the right of the graph where the intensity is utterly negligible. Where I think you are perhaps tripping yourself up is just thinking about transmittance. What also has to be considered is how much energy is available at each wavelength. J & K bands allow 60-80% transmission; 60-80% of virtually nothing. Also, even within the N band window, that still only allows 80% transmission in clear sky conditions. Under cloudy skies, clouds absorb across the entire spectrum and contribute to the GH effect. Clouds are estimated to contribute 25% to the GH effect. When there are clouds present transmission through the N band is essentially zero. Again what then escapes through the N bamd is reradiation from the clouds. I suggest you familiarize yourself with all the bands. J, K and N are not the only ones. The newer microbolometers don't operate in the J or K band anyway, the energy consumed by the cryogenic cooling system proved prohibitive, even if you cool with liquid helium the weight would not permit use on drones. The newer ambient temperature microbolometers are sensitive to the entire range of CO2′s emission wavelengths and they work perfectly, due to the fact that at normal pressures and temperatures CO2′s emissivity is somewhere around 0.0019. The only thing operators ever worry about is water vapor, and never breathe a word about CO2, because the relative contribution of CO2 to skyglow is nill compared to H2O. Your argument where you discount the N band because some days are cloudy is what we all know of as straw man argument. We obviously are not talking about cloud. "The newer ambient temperature microbolometers are sensitive to the entire range of CO2′s emission wavelengths and they work perfectly, due to the fact that at normal pressures and temperatures CO2′s emissivity is somewhere around 0.0019." We have long passed the point where Satoh is ready to say any absurd thing to defend his clearly mistaken original claims. One of those original claims was, in support of a merely distracting (and confusing if adopted) terminological preference, that "the 15 micron IR band radiates from earth's surface and is absorbed to extinction by CO2 in the lowest level of the atmosphere (the elevation of extinction is around 500 feet)". As the 15 micron bandwidth is significant for any near room temperature thermal emission, this contradicts his claim about the emissivity of CO2 "at normal pressures and temperatures". He may be misleadingly citing CO2's emissivity across all wavelengths rather than relative to wavelengths with significant thermal emissions at room temperatures, but then his claim is misleadingly phrased (at the least). More to the point, IR microbolometers typically are tuned to the 7.5-14 micron bandwidth (ie, the atmospheric window as shown in the graph at 329). This is claimed to be the case by wikipedia, by Laser Focus World, and by Optics.org. While micro-bolometers can be, and have been tuned to other wavelengths, I have not found a single example tuned to dominant wavelengths for room temperature thermal emission which was not also tuned to the atmospheric window. Unless Satoh can provide citations with wavelengths specified in microns to at least one decimal place (or equivalently accurately specified frequencies), I have to suspect his claim is bogus. "Your argument where you discount the N band because some days are cloudy is what we all know of as straw man argument. We obviously are not talking about cloud." Brazen bluster is saying that 80% transmission in the N band doesn't matter because sometimes it's cloudy, and making the straw man "when it's cloudy, transmission through the N band is essentially zero". Is there anybody who doesn't know about clouds? Since clouds cover around half the sky, that cuts it from 80% to 40% but it does the same to all other radiation. It's a complete straw man, tin man, and cowardly lion in one swell foop, and you can throw in the man behind the curtain. Brazen bluster is claiming that CO2 is a grey body. Emissivity of a perfect black body is 1.0 (no units), so anything slightly less than that is a grey body. What shade of grey is 0.009 (no units). There are 50 shades of gray and that one wasn't in the book. Claiming CO2 acts like a bb radiator at the top of the atmosphere is brazen bluster, especially since the emissivity of CO2 goes up as the temperature goes down. [RH] Please ratchet the tone down a few notches. If you could provide some citations to support your claims it would be helpful. Tom has provided copius graphs and citations to support his claims. You have only your unsupported word. If you provided citations to support your claims it would be easier to judge them. [RH] Fixed link that was breaking page format. Please check out the link feature on the second formatting tab above the text box. In general, in a scientific argument you must provide citations for any claim you make that is in dispute. If you say that Tom's claim is a "Brazen Bluster" you must provide support for your claim, which you have not done. Tom provided data to support his claims. If you fail to provide support (as you have done so far for all of your arguments), I presume that the support does not exist. The unsupported claim of a random internet guy is not worth anything in a scientific discussion. When you finally provide a citation and it is the incorrect graph that does not make you look very well informed. I am not expert in IR spectroscopy, but I can read and understand the references. You must provide those references to support your claims to be taken seriously. It is not my job to Google all your claims. While I am not expert in IR spectroscopy, it flys in the face of reason for the total emmisivity to increase as the temperature decreases. The percent of emmisivity at a single wavelength could increase, but if the total emmisivity increased than a colder body would heat a nearby hotter body. That violates the first law of thermodymanics. Perhaps you need to review your posts and ensure you are not accidently claiming total emmisivity is increasing when you really mean relative emmisivity is increasing. But perhaps I misunderstand emmisivity since I am not an expert. I have been unable to find graphs with metric units both for pressure-length, and temperature (or Imperial units for both). The second comes from a comment by DeWitt Payne on Science of Doom. "It’s only low for a short path length. I’ve had this discussion before. If the path length is 1 m and the partial pressure is 0.00038 atmospheres then the Hottel emissivity curve to use is the one for 0.00038 atm m. If the path length is 10 km, then the mass path length is 3.8 atm m, which is well above the range of the Hottel charts I’ve seen, but puts the emissivity value for CO2 at ~0.2." That clarrifies the relevance of the units of the curves, ie, the pressure-length, atmospheres per meter in the graph shown by DeWitt Payne (ie, the second graph above). That is, to determine the emissivity of CO2 at a given temperature, you determine the atmosphere-length by multiplying the partial pressure of the CO2 in atmospheres by the path length in meters. If the path length is 10 horizontal kilometers, and the partial pressure is 0.0004 atmospheres, the atmosphere-length is 4 atmosphere-meters (and hence well of the charts above). In an earlier post (@322) Satoh referred to "...the fact that at normal pressures and temperatures CO2′s emissivity is somewhere around 0.0019". The lowest line on the second graph above shows a atmosphere-length of 0.0003 amtmosphere meters (ie, about 300 ppmv over one meter). At 1500 Rankine (560 C), its lowest temperature value it shows an emissivity of 0.005, or about 2.5 times that quoted by Satoh. I presume the chart Satoh used had a shorter unit than a meter. Regardless he is clearly making the error DeWitt Payne attempts to correct in his discussion on SOD. Having said that, DeWitt Payne's estimate of a 0.2 emisivity at standard pressures and temperatures for the full height of the atmospheric column is probably fairly close. That is because the emissivity is the total irradiated energy divided by the total irradiated energy of a black body with the same temperature. (See DeWitt Payne's worked example.) The consequence of this is that as temperature rises, total emission of a black body rises with the fourth power of temperature. Total emission of CO2 as a thermal emitter will also rise, but in bandwidths in which it already radiates strongly, at a far lower rate than with the fourth power of temperature. The result is a general decline in emissivity even while emissions at every wavelength in which emissions exist actually increase. The general decline is not absolute. If a potential emitting wavelength comes within the range of thermal radiation, it will initially increase its emissions at faster than the 4th power of temperature resulting a temporary rise in emissivity with temperature, as can be seen on the CO2 charts for temperatures between 1000 and 2000 Rankine (280-840 C). The upshot of all this is that emission at a given wavelength for thermal emission always increases with increased temperature. When Satoh claims that "We all know, 200 K is very cold. If the elevation of this emitting layer of CO2 climbs higher, and therefore becomes colder, it makes the temperature closer to 200K and therefore the emission would be STRONGER, not weaker" (@320, refuted @321) he is simply wrong, and is not supported by the Hottel charts in that conclusion. On the other hand, when he says, as @334, "... the emissivity of CO2 goes up as the temperature goes down", he is (in general) correct, but it does not have the consequences he assumes. Put simply, emission is not emissivity. Satoh incorrectly assumes they are. This diversion has not been without benefit, however. Contrary to his claim @337, his reference is a good one, showing Hotel charts for H2O alone (Figure 2) and CO2 alone (Figure 3) as well as both combined in other figures. 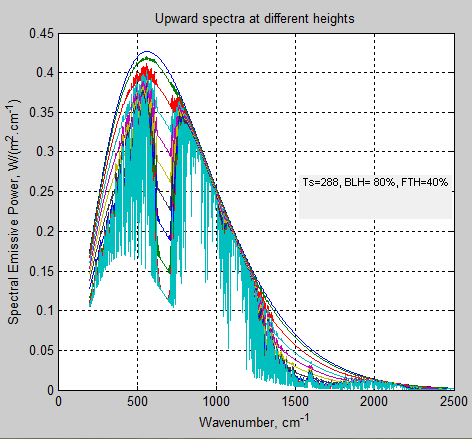 I also claims that the Exponential Wide Band Model (EWBM) as well as Narrow Band Models (NBM) perform well, with accuracy primarilly limited only by the accuracy of the original spectral absorption lines in such databases as Hitran. Satoh, apparently, did not notice the endorsement, and that he has cited in his argument against the results of NBMs a paper that endorses them. Tom, excellent work, except the second graph is for water vapor. The first is for CO2, which demonstrates the sea level values, seasonally averaged, that I gave in @322. I don't mean to criticize, it's a simple mistake. Satoh @341, at one point I refer to the graph posted by DeWitt Payne as the "second graph". That was potentially ambiguous, but was intended to refer to the graph with units of degrees Rankine on the x-axis (which is for CO2). Fig 1 (b) is, of course, for H2O, while figure 1 (a) is also for CO2. Refering to that, and considering the upper most line (4 foot atmospheres). With a CO2 partial pressure of 0.0004 (ie, 400 ppmv), that equates to 10,000 feet or 3,048 meters. As can be seen, that approximates to an emisivity of 0.2. For the same distance, a pressure-distance of 20, corresponds to a partial pressure of 0.002 atmospheres which is a very low value for water vapour concentration, yet yields an emisivity of approx 0.6. Cearly there are overlaps between CO2 and H2O absorption bands, but given the depth of the atmosphere, these are underestimates of the emissivities of the two gases for the full depth of the atmosphere. Therefore, as a reasonable sanity check on your claims, we can simply combine them by addition for a combined emissivity of 0.8 - indicating just 20% of surface emissions escape to space - and that in clear sky conditions. Therefore, correctly used as a sanity check, the Hotel emission graphs support the findings of Khiel and Trenberth. "... using 400 ppm and sea level path length of 33 meters you'd get a line that would read .0000121 atm m"
It is atmosphere - meters, not "atmosphere/meters". Ergo 400 ppmv (= 0.0004 atm) with a path length of 33 meters equates to 0.0132 atmosphere meters. The closest contour shown to that is 0.012 atmosphere meters (ie, pathlength of 30 meters with current atmospheric concentration of CO2). 15 degrees C (=288 K) is 519 Rankine, at which temperature the 0.012 contour approximates to an emissivity of 0.06. That is, just 30 meters of atmosphere at current CO2 concentrations and excluding the effects of water vapour eliminates 6% of upward surface emissions. Satoh, you're acting a lot like the Black Knight. I don't know where your 10,000 feet comes from. I think you are confused by path length. When a solid or liquid emits a photon, it emits from a patent surface, the solid surface or the liquid surface, but when a gas emits a photon, being a gas, it emits from a region of space. Emissitivy is not calculated the same for a gas. The path length refers to the length between emitting molecules, in a straight line. The shorter that path, the greater the emissivity. The mean path length at sea level for photons between CO2 molecules was 33 mm years ago but I'm saying 30 mm now which is .03 m. The emissivity of CO2 at sea level goes along the curve of .0004 x .03 which is the .000021 I mentioned, which is not on the graph but you can visualize it. Wait, did you think that 10,000 feet was the length the photons went, the column of air, from surface to top of atmosphere or something? There is no possible way an IR photon at 15 microns is going through 10,000 feet of air. It's blocked right near the ground. Gee whiz. Blocked and turned into kinetic heat. Please tell me where your 10,000 feet comes from. I see what you did. You randomly picked the top line and said "it's 4 foot atmospheres which is .0004 X 10,000 feet" so it would point to the 0.2 mark. That's pretty arbitrary. The mean free path length of 15 micron photons at sea level is definitely not 10,000 feet so you can't use that line. Mean path length applies to absorption, and it also applies to emission. They are inverse of the same process.